Despite how common diastasis recti is, understanding what it is and how it’s caused can be as confusing as trying to figure out how to pronounce its name! Rarely do you find a condition so common, yet so under-the-radar when it comes to awareness, detection, prevention, and treatment. We break down everything here, in a simple and clear fashion, to help you avoid it, or recover from it more quickly. 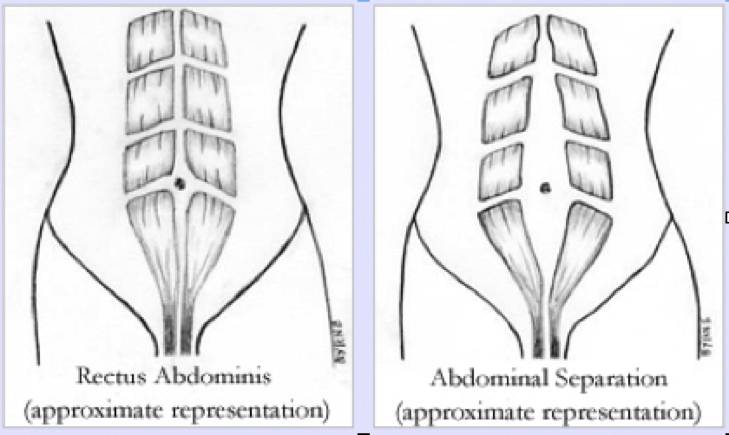 In short, diastasis recti (DR) is when the right and left sides of the rectus abdominis muscle (your “6-pack” muscle) move wider apart (as in the image on the right at the top of this page) due to a thinning and weakening of the connective tissue — called the linea alba — that holds the two sides together. A small separation is normal, but a separation greater than about 2 finger-widths is considered DR. The word “diastasis” means separation, and “recti” refers to the rectus abdominis muscle. Sometimes DR is confused with a hernia. However, DR is just a thinning and weakening of the linea alba tissue; whereas a hernia is when the internal contents (intestines or organs) actually protrude through a weak point in the abdominal cavity (or other cavity). Hernias require surgery to address, whereas DR can typically be healed without surgery. Simplistically speaking, it all comes down to one thing: excess intra-abdominal pressure. In other words, think of your growing belly like an expanding balloon. As you blow air into the balloon, the pressure continues to build inside it. After a certain point, if you continue to force air into that balloon, it will eventually pop. This same general idea can be applied to your abdominal muscles. All your abdominal muscle layers are connected at the front midline of your body by a tissue called the linea alba. Think of the linea alba tissue like “silly puddy;” it’s strong, but flexible. If consistent and excessive outward pressure is placed on that tissue (like from a growing belly during pregnancy), then it eventually thins and stretches out so much that its consistency becomes more like cellophane, and it loses its ability to hold anything together. When this happens, your outermost muscle layer – rectus abdominis – begins to drift apart. From an appearance perspective, DR leads to a “pooch” look in your belly, like in the image below. What you are seeing is the woman’s abdominal contents protruding through the separation caused by the thin and weakened linea alba. Beyond appearance though, DR may indicate a weak and ineffective core. This can lead to a host of problems including low back pain, pelvic or hip pain, incontinence, constipation, bladder or rectal prolapse. It can also put you at greater risk for developing a hernia, which requires surgery to fix. Therefore, correcting DR is not just important to help you look better, but also to help you feel better, and prevent injury and other complications. What factors make someone more susceptible to getting diastasis recti? You may notice a cone or dome-like shape in your belly during any movement that engages your abs, like in the image above. It’s often easiest to see after pregnancy, when the muscles are lax, but you may be able to see it during pregnancy as well. You can also perform a self-check. We do not recommend doing this until you are at least 6 weeks postpartum. Recall that every woman will have some degree of DR during the third trimester, which will close to the point it will remain at by 4-6 weeks. After 6 weeks, you will get a more accurate assessment of your true separation. Watch this video to learn how to perform a proper self-check. It’s always a good idea to ask your doctor to check you at your postpartum visit. While doctors should check for this, most unfortunately do not, so you have to ask. While you can perform this self-check during pregnancy as well, some women find poking their bellies during this time to be uncomfortable. Also, remember if you check during your third trimester (especially toward the end), you will likely have it because nearly everyone has it by this time. Activate your “Core Canister”: The Core Canister is the term we use to refer to the deep core muscles of the diaphragm, transverse abdominis, and pelvic floor. These critical deep core muscles function as a “pump” to help avoid excess intra-abdominal pressure. Read Prenatal Core Training: Where to Start to learn more about these muscles and how to properly activate them. Avoid “sucking in”: While you may be tempted to do this to make your belly look smaller, it can actually have the opposite effect. Constant “sucking in” shuts off your Core Canister pump, and creates a buildup of excess intra-abdominal pressure that can lead to DR and pelvic floor issues. Sit up tall: Slouching is crunching. If you can train yourself to sit up tall at your desk (bottom of rib cage in line with top of hip bones), you’re not only relieving a great deal of pressure from your abdominal wall, but you’re also working your core at the same time because your deep core muscles have to work harder to keep your body upright. Who knew just sitting up straight was a core workout! Watch how you bend over: If you’re like most of us, you likely round forward to pick something up off the ground. But building on the point above, bending over with a hunchback, is crunching. Train yourself to bend from your hips. In other words, bend your knees and send your hips backward — keeping your spine long — as you reach for the ground. Avoid twisting movements: General rotation where your hips and shoulders stay aligned is fine, but any twisting movement with disassociation of hips and shoulders should be avoided (like bicycles or twisting yoga poses). One easy modification for yoga is to perform an “open twist.” Instead of rotating toward your front leg, rotate toward your back leg so hips and shoulders stay aligned. Avoid “Bearing Down” on the toilet: Hormonal changes during pregnancy can cause increased constipation, which may lead you to hold your breath and “bear down” on the toilet. This causes that pressure buildup though. Help alleviate this by placing an 8-12” stool beneath your feet when on the toilet to put your body in more of a squat position. This position helps open up your colon to allow for easier waste excretion. Regress plank-like exercises as your belly grows: As your belly grows, it places too much pressure on the outer abdominal wall when in a downward facing plank position – even in the strongest women. Therefore, as your belly gets bigger, you’ll need to begin to regress planks and any plank-like movement (push-ups, renegade rows, etc). You can do so by placing your knees on the ground or performing incline planks. Always watch for that “coning” in your belly as a key sign you need to regress. Air on the side of being conservative. If you’re not sure if you should be doing a plank or not, best to avoid it. There are plenty of other beneficial core exercises. Keep weight gain in check: It’s important to ensure you gain enough weight for the health of your baby. However, try to stay within the healthy weight gain guidelines, as excessive weight gain can lead to diastasis (the larger the belly, the greater the risk). AVOID all planks and any downward facing movement, high impact, any advanced core work, yoga, Pilates, and most forms of traditional exercise. Yes, there’s a lot of avoiding, which is why it’s important to focus on correcting this, so you can get back to doing all the things you love. Find a qualified physical therapist (ideally one who specializes in women’s health and treats this condition frequently) to help you properly heal or work with a PROnatal Fitness Specialist. Want more support? If you’re looking to strenghthen your core properly, prevent DR, or help to heal it, consider working with one of our expert Personal Trainers. Not in the New York City area? Check out our list of PROnatal Certified Trainers.